If your understanding of the current contretemps between Israel and the United States is limited to what you read or see in the Main Stream Media, then the village of Al Nabi Saleh (the Prophet Salih) should be of interest to you. So gather round. This particular contretemps has been described euphemistically, by the New York Times‘ Jerusalem bureau chief Ethan Bronner, as a gaff over an announcement of plans for more “Jewish housing” to be built on occupied land in the Palestinian West Bank. The “Jewish housing” in Bronner’s story is the most recent step in Israel’s long range settlement plan for the West Bank and Jerusalem. These plans are most certainly known to Vice President Joe Biden. The vice-president is an old school politician who expects his side to play by the rules. And Rule Number One is don’t surprise your teammate while he is in Israel to make nice-nice with a staunch ally. If the Main Stream US Media would study the settlement maps and the charts identifying future plans for additions to existing settlements it could report the real story of the “Jewish housing” plan. The latest announcement, which was not a surprise to anyone who had been paying attention, calls for Israel to construct 1600 new housing units inside East Jerusalem. It was soon joined by another step already in the pipeline, a plan to construct 20 new apartments on land adjacent to the Shepherd Hotel in East Jerusalem. Information on past and future settlement plans is available from a web site run by the Washington-based Foundation for Middle East Peace, which, since its formation in 1979, has performed a valuable service by tracking and reporting on Israel’s settlement project. Daily news reports on Palestinian resistance to the settlements are available at the Palestinian Ma’an News Service, which has bureaus in Gaza and Bethlehem. The photo above, of a modern-day David, is a Ma’an image. An estimated 95 percent of Palestinians in Gaza and the West Bank, who have internet access, check Ma’an on a daily basis. Few of them were surprised by the announcement of 1600 (plus 20) new settler family units. Thumb through your local Western newspaper and you might see the occasional small reference to “rioting” Palestinians confronting Israeli soldiers. What you will not see is an acknowledgment that the IDF is in the West Bank to guard settlements built on land confiscated from Palestinians. In the US, little attention is paid to these frequent David-Goliath encounters, Outside the US, however, there is a steady drum beat of media coverage of Palestinian protests, reports that further erode what little international support that remains for Israel’s policies in the West Bank and Gaza. In an attempt to shut down media coverage of protests in the villages of Bil’in and Ni’lin, the IDF has designated the two villages as “closed military zones”every Friday (at least) for the next six months. American media, moving in lock step with its customary Zionist ideology, attaches little significance to the darkness that has descended on Israel, in sharp contrast to the courageous voices within Israel who cry out to the world, pay attention. One of the harshest of the 10 plagues has smitten the children of Israel this Passover, and they are stumbling about in pitch darkness, bumping blindly into anyone in their way as they head toward the edge of the precipice. Warm friends, cool friends, icy enemies: Jordan and Turkey, Brazil and Britain, Germany and Australia – it’s all the same. And if that’s not enough, the myopic Jewish state also has gone and collided head-on with the ally that offers existential support. Israel has become an environmental hazard and its own greatest threat. For 43 years, Israel has been ruled by people who have refused to see reality. They speak of “united Jerusalem,” knowing that no other country has recognized the annexation of the eastern part of the city. They sent 300,000 people to settle land they know does not belong to them. As early as September 1967, Theodor Meron,then the legal adviser to the Foreign Ministry, said there was a categorical prohibition against civilian settlement in occupied territories, under the Fourth Geneva Convention. 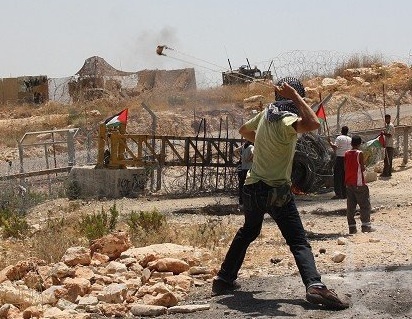 In recent weeks there has been an escalation of Israeli military violence against the weekly demonstration in the village of An Nabi Saleh, which last week led to 25 injuries, as well as attacks on 12 homes and 3 cars. Despite this, approximately 100 villagers joined the demonstration on Friday and attempted to reach their land, much of which has been stolen by the nearby illegal settlement of Halamish. The Israeli army prevented the demonstration from leaving the village by surrounding it on all sides, and firing large amounts of tear gas and rubber coated steel bullets directly at the demonstrators. 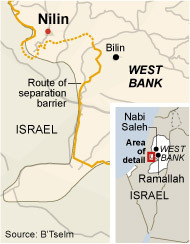 The confiscation of Nabi Saleh land began in 1977. I first visited Nabi Saleh in November, 1977, traveling inside the West Bank with a group of journalists. We were there during the week Egyptian President Anwar Sadat made his surprise visit to Israel. Sadat delivered his historic address to the Israeli Knesset on November 20. The Mayor–Karim Khalaf — a landowner in the area, was first elected in 1972 and surprisingly re-elected in 1976 when most other mayors on the West Bank were turned out of office for reflecting not enough sympathy for Palestinian nationalism, specifically a commitment to the Palestine Liberation Organization (PLO). . . . In our interview with Khalaf, he vigorously criticized Sadat’s failure to identify the PLO as the proper Palestinian representative for peace discussions. He seems not to trust the Israelis to give the West Bank its sovereignty. In his modern city hall office we listened as Khalaf alternately boasted of the future West Bank state and deplored Israeli actions that appear to go counter to that future. The Gush Emunim (bloc of the faithful), an orthodox Jewish group, has been establishing its own settlements in the West Bank, insisting that it has a commission from God to recapture the biblical lands of Judea and Samaria. The settlement that was disturbing Khalaf was the most recent of six which Prime Minister Begin had sanctioned the week after his return from his initial meeting with President Carter this summer. Our group, which included four Americans and a European journalist, decided to visit the settlement. With the mayor’s help we studied the map and then drove north. Unlike the other 44 established Jewish settlements in the West Bank, this one is not on a map, and it has no name. But we knew that the settlers had been given permission to live in an abandoned “Taggart Fort,” one of a series of military installations placed on strategic hills by the British during the Mandate period. Formerly used by Jordan as a police station, this fort near the village of Al Nabi Saleh had been empty until Prime Minister Begin persuaded a group of Gush Emunim members not to take over open land but to reside instead within the more secure walls of the fort. We drove to the fort, located on the hill overlooking the village of Nabi Saleh. One of our party, who speaks Hebrew, asked the soldier guarding the gate if we could come in and talk with the civilian settlers. In a country obsessed with security checks, I was surprised that he waved us through, carefully replacing the chain that blocked the road behind us. Two men who greeted us promised an English-speaking occupant, and we were soon welcomed by Schomit Abramowitz, a pleasant dark-haired woman in her late 20s, who invited us up to her family quarters for tea. Born in Israel, she lived for 12 years in Chicago, so we talked briefly about her time there. (She wondered if I had known Mayor Daley.) When we asked if we could tour the fort, she proudly showed us around. Eighteen orthodox Jewish families have joined with about 25 nonorthodox Israelis to establish this community, which will soon move out of the fort into concrete block houses nearby. A contingent of soldiers, tents pitched beside the fort, are apparently on hand for protection. Our English-speaking hostess has three small children — two of them in diapers, which she must wash with boiling water on a portable stove. The children, two of whom slept through our talks, share a 12-by-12 foot room with their parents. Water from the fort’s old well is still unsafe for drinking, so much of their water is brought in by truck. My story was reprinted in the Chicago Sun Times, a decsion by the paper which, I suspect, had more to do with the local Chicago family angle than it did with a desire to educate readers on the settler movement. The fort stood on a hill overlooking the village of Nabi Saleh. There is a mosque in the village which honors Samuel. Tradition suggests that Samuel was buried on the ground where the village now stands. The abandoned Jordanian fort soon became the Jewish settlement of Halamish, which today has around 1000 residents. Over the decades, Halamish has expanded its land control, Most recently the Halamish settlers confiscated a natural spring, a water source for the village. For the past six years, nearby villages Bil’in and Ni’lin have conducted weekly marches to protest the construction of Israel’s “security” wall, which snakes deep into Palestinian land just west of the area where Bil’in, Ni’lin and Nabi Saleh are located. Ms. Tawil, with her husband, David, a banker, moved to Ramallah from Nablus several years ago. The home in which they live would suggest that they are among the upper-class members of West Bank society. We visited in the Tawil living room drinking tea and eating fruit, served by two attractive teen-age daughters. Years later, after Yasir Arafat returned to Palestine and set up his capital in Gaza, I went with a group of religious leaders to Gaza to meet with Arafat. I knew that he had married one of Raymonda Tawil’s “attractive teen-age daughters” who had served tea to our group of journalists. Her name is Suha. Her mother’s home was a favorite gathering place for visiting journalists. Madame Suha confessed she did not remember our particular visit, even after I reminded her that it was the day after the Sadat speech. We had tea, once again, with Madame Suha in her residence, before our group went to meet with Arafat. It was a brief time of optimism and hope, which was soon dashed by the failure of the negotiations between President Bill Clinton, Arafat, and Israeli Prime Minister Yitzhak Rabin. Rabin was offering to concede land to Arafat, which the old revolutionary wisely recognized was an empty gesture. If he did not know of Israel’s long range settlement plans, he had his suspicions. One thing is certain: The villagers of Nabi Saleh do know all about Israel’s plans for the future. They have lived with the result of those plans for more than three decades. The picture at top is a Maan image from the Maan news service. The map is from B’Tselm. This entry was posted in Middle East Politics. Bookmark the permalink. Is not the United States complicit in all of this 30+ years of resettlement activity? And if so, where do we stand in the mind of the world court, the world conscience and American values of human rights, justice and peace for all? Please be aware that the problem actually dates back to the turn of the 20th Century; our nation now reaps the bitter harvest sown long ago. Alan Hart’s excellent series of books on this topic (in particular, the first one) details the complicity of both Britain and the U.S. in the Zionist land grab. Jim: Let us fervently hope that President Obama will take action soon. The world awaits. Harris Fawell, Member of Congress, retired. It is too late for the Israelis to claim that Jerusalem “belongs” to them. By that reckoning Seattle “belongs” to the Queen of England! To use the Biblical text as a “proof” for their destructive, inhumane land-grab of Jerusalem and the West bank is disgusting and dangerous.